The skier was just learning how to turn. Her goal was to later take a run down the easiest of the green runs on the mountain. She looked up the slope above the beginner hill and saw a steep double-black run with moguls and with skiers gingerly turning among them. "Why would anyone want to do that?" she asked. It would be some time before she would be able to understand why they would want to "do that", but it was clear that they did not have to ski that terrain, it was clear they wanted to ski there so much they accepted the cold and blustery wind that was swirling powder about them, and it was also obvious that they were even willing to pay to do it So it must have been fun! Some say the sliding sensation is akin to what a bird might feel while flying. Others find it exhilarating to move body parts in precise ways to manage balance and to feel the sensation of acceleration in a turn or a steeper descent. There is also the stimulation that many feel from using the body in a physical way, perhaps a sensation that comes to modern man from his roots, and perhaps akin in a way that horses in the meadow seem to feel when they romp together as a storm approaches or the way an otter must feel sliding down a mud trough into a river..
And those--and more--are the reasons we ski. SKIING IS A LIFETIME SPORT. My son learned while 1 year old (he was nearly 2), another person, now an instructor, started skiing when he was 58, and I have started persons into skiing in their 70s. 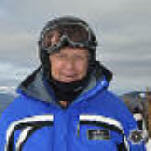 Many skiers continue actively into their 80s. Yet how many of us learned other sports as youths--football, baseball, basketball--and still practice them? It is hard to find enough persons to field teams and times when they can get together, or to find spots where games can be played. Skiing, on the other hand, can be done with any combination of others, or alone. And there are plenty of ski areas in most areas of the U.S. and many areas of the world. Because skiing is a lifetime sport, if one enjoys physical activity it is well worth learning. Perhaps learning to ski or to ski better would go a long way to improve the health of Americans. This "Why Ski" page last modified 11/03/2017 07:21:43 AM. Did you come here from a link on another website? For latest version of this page, copy to your browser: http://www.SkiMyBest.com/skiwhy.htm. Copyright © 2013, 2014, 2015, 2016, 2017, 2018, 2019. William R Jones.